Lawyer for Islamist terrorist suspected of carrying out deadly Brussels Jewish Museum shooting says he will fight to be tried in France. Mehdi Nemmouche, the French Islamist arrested on suspicion of mass-murder at the Brussels Jewish Museum, is to contest being handed over by France to Belgium, his lawyer said Wednesday. Nemmouche, 29, was arrested in Marseille on Friday. He wants to stand trial in France and will fight a European arrest warrant issued by the Belgian authorities, the lawyer, Apolin Pepiezep told AFP. Nemmouche's decision to contest the warrant could delay by several weeks his return to Belgium, where authorities wish to question him in connection with a May 24 shooting which left four people dead. A first hearing on the arrest warrant has been scheduled for Thursday at an appeal court in Versailles, in the Paris suburbs. "We want him to be judged in France, first of all because he is French and he is in France," Pepiezep said, emphasizing that some of the charges Nemmouche faces, such as the illegal carrying of arms, have been brought by the French authorities. Nemmouche, who spent over a year fighting in Syria with one of the most brutal Islamist groups involved in that country's civil war, was arrested in possession of a Kalashnikov and a pistol similar to the weapons used in the museum killings. He was also found to be carrying a camera on which he appeared to have filmed himself admitting responsibility for the attack, according to police sources. "My client and I weighed up the pros and cons and agreed to oppose the request," the lawyer added. "We prefer that his case should be handled under French jurisdiction and we will argue that before the appeal court tomorrow." The lawyer said he would not rule out an appeal in the event that Thursday's hearing results in the court supporting his client's transfer to Belgium. Under European procedures - which are designed to be much quicker than a full extradition process - the suspect will have three days to appeal and the higher court will then have 40 days to issue a ruling on whether the handover can go ahead. According to police sources, Nemmouche has said virtually nothing to his interrogators since he was arrested following a random customs inspection of the bus on which he was travelling on its arrival in Marseille. 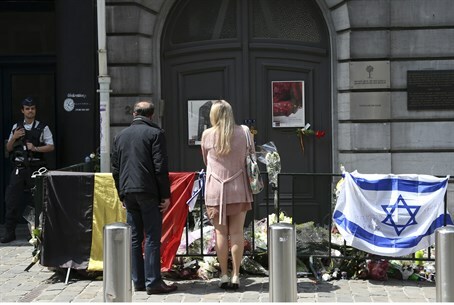 Nemmouche's victims in Brussels included an Israeli couple and a French volunteer at the museum, who were all killed instantly. Another man, a museum employee, was left in a critical condition and died shortly afterwards. The 29-year-old is thought to be the first veteran of the Syrian conflict to have carried out an attack of this kind in Europe. Terrorism experts have warned there could be more as battle-hardened terrorists who were born and raised in western European countries make their way back from Syria. Estimates from security agencies suggest there could be more than 1,500 such militants in Syria. Nemmouche's attack came just over two years after another French Islamist gunman, Mohammed Merah, killed seven people in the southern city of Toulouse. Merah's victims were a rabbi, three Jewish children and three French paratroopers. He died himself in a police shootout.